To see reviews, maps, where to stay, and tourist information, go to the Thiruvananthapuram (Trivandrum) trip maker website . Chandigarh to Thiruvananthapuram (Trivandrum) is an approximately 5.5-hour flight. You can also do a combination of taxi and flight; or drive. April in Thiruvananthapuram (Trivandrum) sees daily highs of 38°C and lows of 30°C at night. Wrap up your sightseeing on the 22nd (Sun) early enough to travel to Munnar. Kick off your visit on the 22nd (Sun): examine the collection at Tea Museum, pause for some serene contemplation at C.S.I Christ Church, and then take in nature's colorful creations at Tea Gardens. On the 23rd (Mon), you'll have a packed day of sightseeing: take in nature's colorful creations at Rose Gardens, admire the natural beauty at Photo Point, and then admire the engineering at Mattupetty Dam. To see photos, more things to do, maps, and tourist information, read Munnar journey maker website . You can do a combination of flight and taxi from Thiruvananthapuram (Trivandrum) to Munnar in 3 hours. Alternatively, you can do a combination of bus and taxi; or drive. In April, plan for daily highs up to 40°C, and evening lows to 29°C. Finish up your sightseeing early on the 23rd (Mon) so you can go by car to Thekkady. Start off your visit on the 24th (Tue): contemplate the waterfront views at Periyar Lake and then look for all kinds of wild species at Periyar Tiger Reserve. Plan my trip to Thekkady with suggested itineraries provided by Inspirock. Traveling by car from Munnar to Thekkady takes 2 hours. Finish your sightseeing early on the 24th (Tue) so you can drive to Kochi (Cochin). 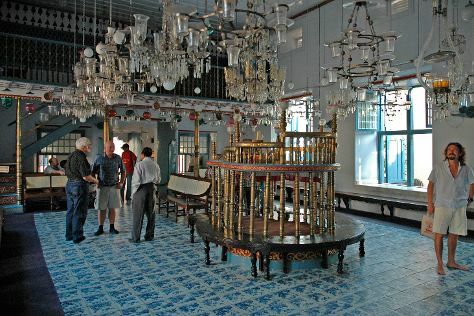 Kick off your visit on the 25th (Wed): contemplate in the serene atmosphere at Paradesi Synagogue, admire the landmark architecture of Mattancherry Palace, then explore and take pictures at Kerala Kathakali Centre, then don't miss a visit to Chinese Fishing Nets, and finally contemplate in the serene atmosphere at Church of Saint Francis. For ratings, reviews, more things to do, and more tourist information, read our Kochi (Cochin) online vacation planner . Drive from Thekkady to Kochi (Cochin) in 2.5 hours. Alternatively, you can do a combination of bus and taxi. In April in Kochi (Cochin), expect temperatures between 39°C during the day and 30°C at night. Cap off your sightseeing on the 25th (Wed) early enough to travel back home.